Posted by Nick Prescott on 25 April, 2016. If you are looking for bedroom design ideas, here we offer tips on how to create the boudoir of your dreams. As interior designers, we take you step by step through our approach, which you can then apply to your own bedroom design. We use a recent bedroom refurbishment as a case study, and hope you find it helpful. There is a bewildering range of options on the market and sometimes it’s difficult to know where to start. Before you jump in, step back, ask yourself what you want for this bedroom and write it down. This will help you to clarify your requirement. Then you’ll have a framework on which to build and the picture will become clear. Who is to use the room and do they have any specific needs? Apart from the obvious, what else might you want to do in the bedroom? Read, apply make-up, surf the internet, watch TV? What specific furniture do you need in a bedroom? What are your likes and dislikes – colours, window dressing, flooring? What needs to be stored in the room? How is the heating and ventilation at present? What cuttings or images do you have to show the sort of bedroom you want? How much are you prepared to spend on the refurbishment? Our clients often have some ideas, but need help bringing them together. Our questionnaire is designed to gather information; the responses help to shape the requirement. Do you need bespoke storage to fit an odd space? Quality of bed linen – thread count (260 is reasonable); oxford or plain pillow cases. Could you move a radiator to a better position? Location of light switches – one in reach of the bed, perhaps. Mirrors – full length? other? good lighting for the mirror position? 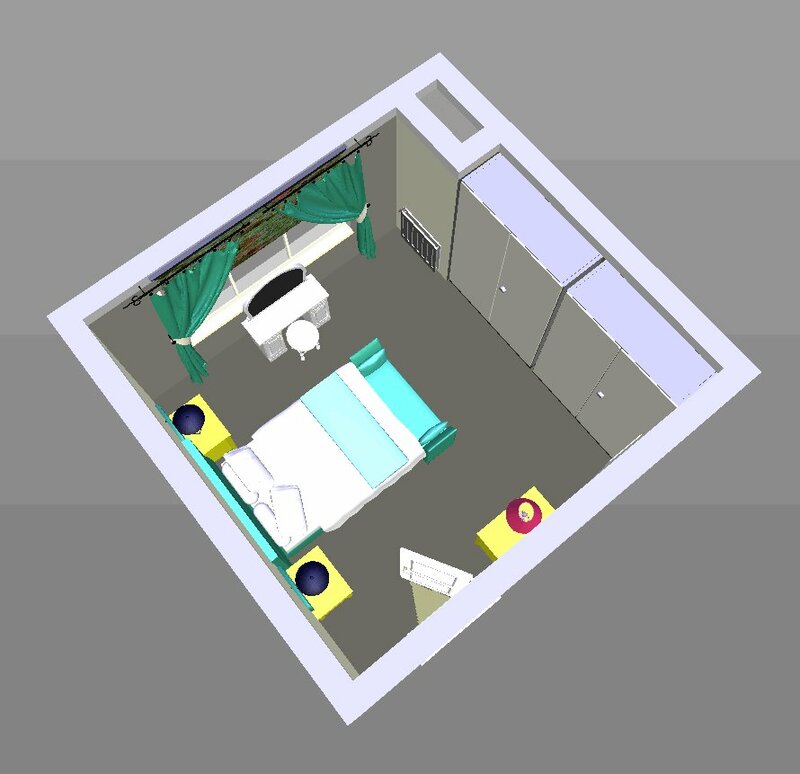 Is an en-suite to be part of the refurbishment? Armed with a client’s brief, the first thing we do is produce an initial floorplan to scale. We would also create a simple 3D visual to help our clients to see the space. You can find a basic 3D tool for free on line. Otherwise, a pencil, paper and scale rule will do, but watch out for heights of wall features and windows that may not appear on a simple plan view. And make sure you measure any furniture that you intend to keep. Interiors magazines and the internet offer plenty of bedroom design ideas. Pinterest and Houzz are particularly good because they are very visual. Use these to create a montage of images that give the look and feel of the bedroom design that you want to achieve. Now it’s time to create a sample board (or mood board). Ask local suppliers for fabric and floor samples, then you can start to create a scheme. You’ll also need one or two paint sample pots. 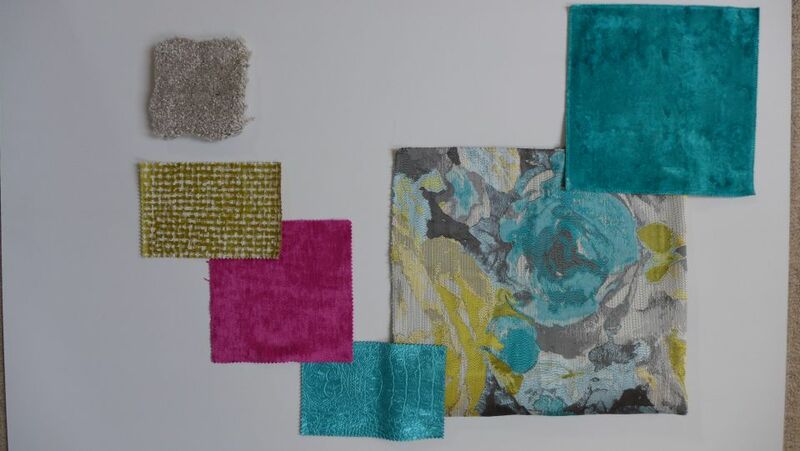 In our case study, we created 6 bedroom designs using different combinations of colours and fabrics, all of which looked great; but we needed to narrow this down. We had also produced a provisional price estimate to confirm that each concept was affordable. Each option was presented to our client on a large board (A0 from a local art shop) painted with the proposed wall colour, and scattered with fabric cuttings to represent the curtains, blinds and bedlinen. A carpet section was added, along with samples of the proposed furniture finish and other features. You can do similar and see which combination works best. The further advantage of the large painted board is that you can hold it in different positions around the room to see what it looks like at different times of the day and in different lights. Having laid out the options side-by-side for comparison, we observed how our client reacted to each. Would she prefer the warmer tones with pinks and roses, or the cooler tones with pale blues? Our client expressed a preference for two of the options, which then became the focus for more detailed work. With the basic floorplan agreed, we were also able to superimpose the electrical overlay showing where the lights and sockets would be positioned. To finalise the two options, we made a further visit to the showrooms at Chelsea Harbour with specific fabric colours in mind. We acquired a large returnable sample to show the extent of the blind fabric pattern (sometimes a small cutting isn’t enough). We then presented the final look for the two competing options, along with images of proposed furniture, the electrical layout and revised budgets. 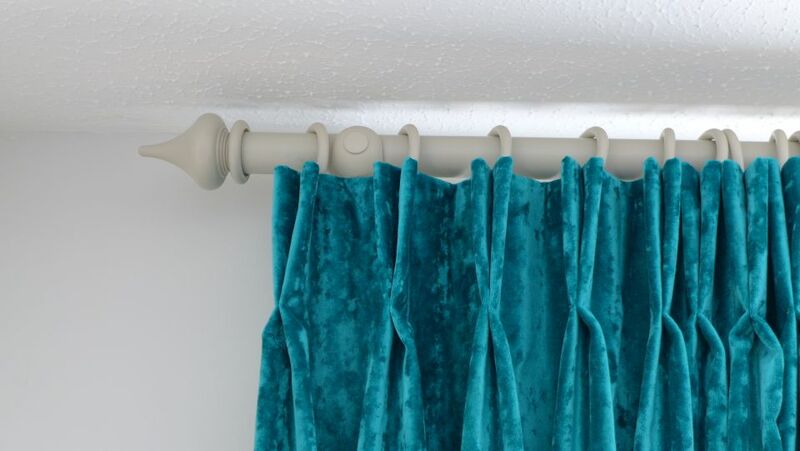 Our client was delighted with both schemes and found it hard to choose, but eventually decided on the dramatic and luxurious teal-based scheme. People often focus on the main bedroom items, but then acccessorise as an afterthought. They even forget about lighting, sockets and switches. Our approach is to design for everything at the start. Storage, flooring and wall colour are obvious, but what about wall art, cushions, and a bedroom chair? A stylish tip is to make scatter cushions and throws from the same fabric as the curtains or blinds; make sure you order that little bit extra. 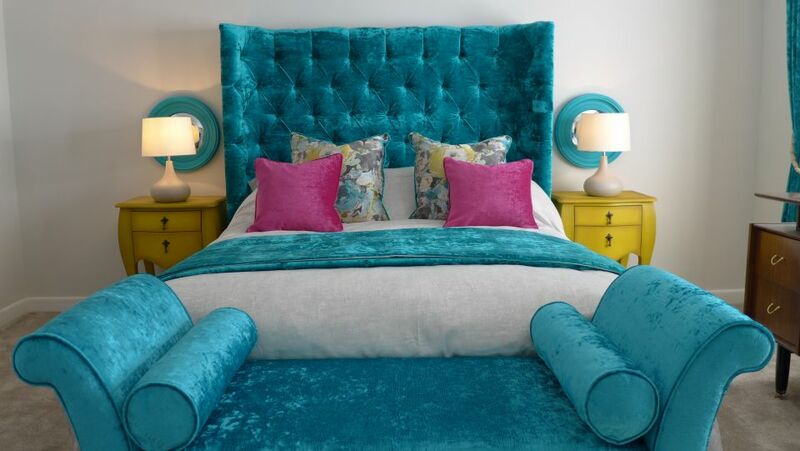 We also add an accent colour – here it is fuchsia pink which complements the blue and gold. Notice also how we don’t mix too many patterns. A strong pattern works well with an adjacent plain fabric. 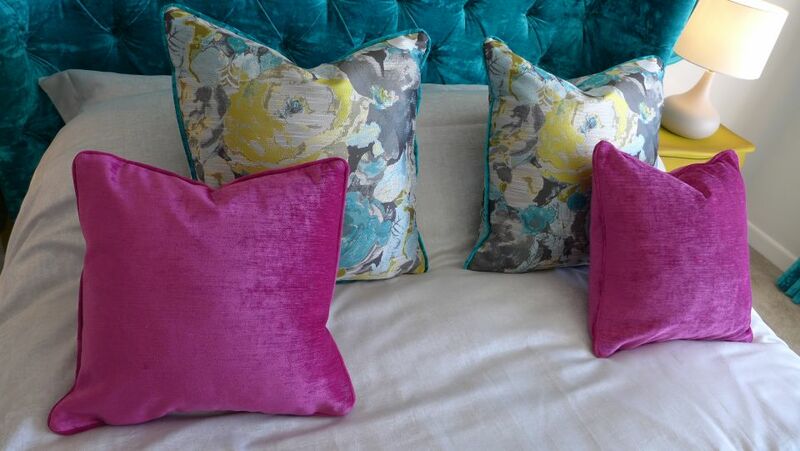 The keen-eyed amongst you will also have spotted that we piped the cushions with headboard fabric. A bedroom chair is a chance to add that extra piece of luxury. 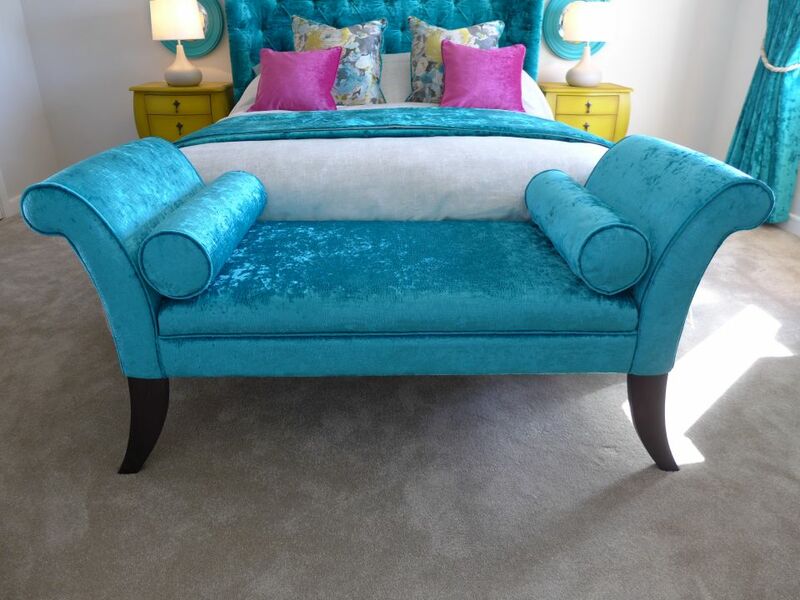 You don’t need a footboard – jut add a chaise to define the end of the bed. You can choose from plenty of luxury fabrics. 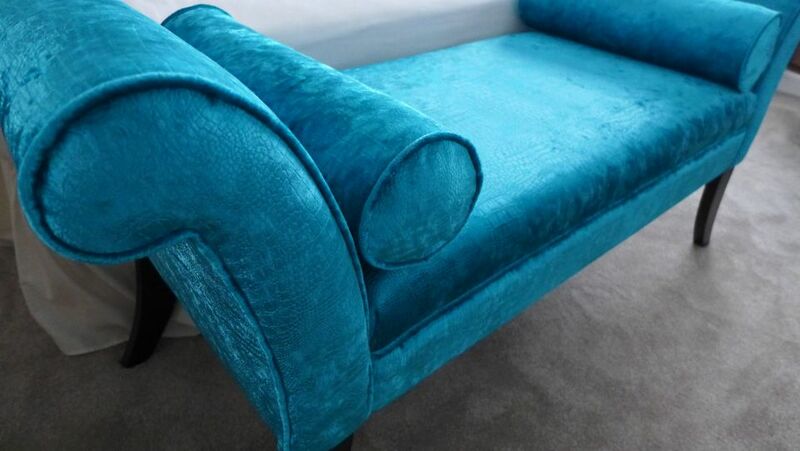 Here we chose this scrumptious aqua crocodile chenille. If you have an old piece of furniture that you are reluctant to throw away, why not simply re-upholster it and give it new life? In this bedroom design, we introduced a few nice little touches like the concave mirrors behind the bedside lamps. We bought the pair for about £80 from the internet then painted them in a complementary colour. 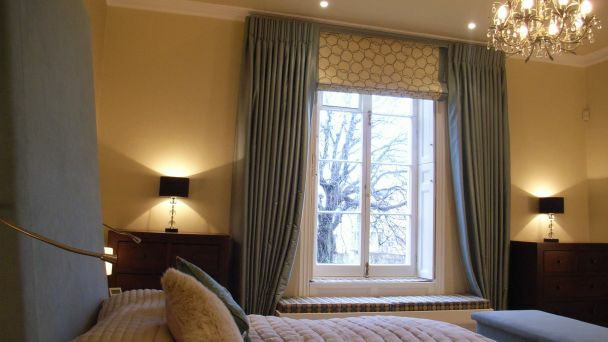 For a bedroom design, we often look to combine curtains with blinds. 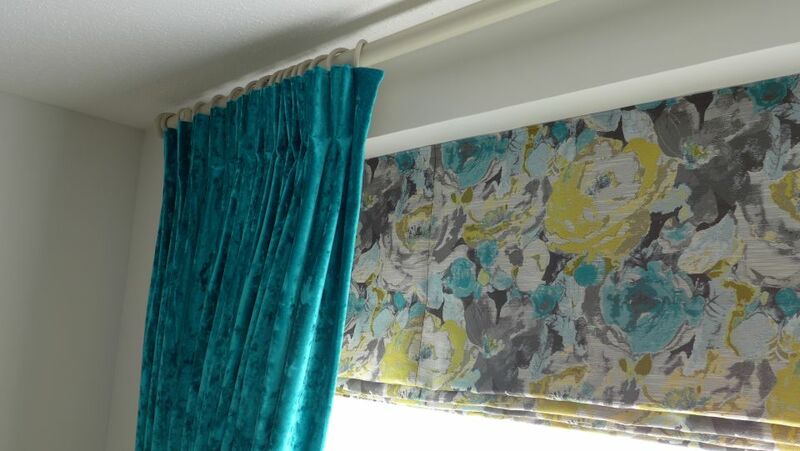 The roman blind in this case has a black out lining, with the curtains essentially dressing the window. But occasionally our client would wish to pull the curtains completely, so she has that option too. We also favour contemporary twists on traditional features. In this case, we chose a minaret curtain pole in a colour toning with the walls. 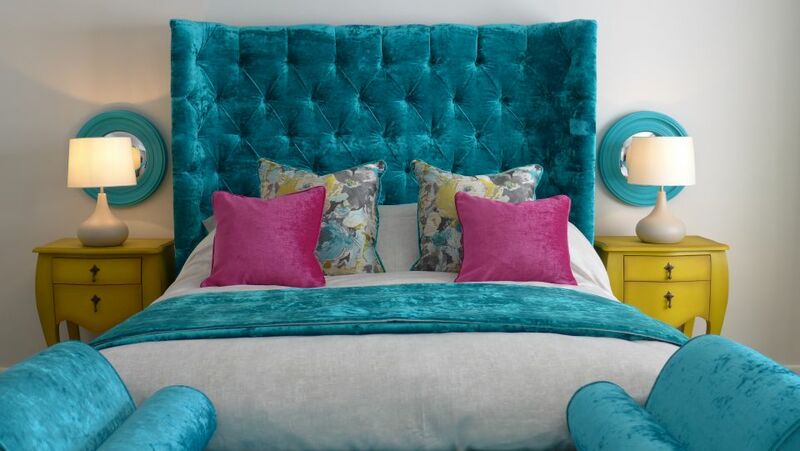 With our client’s preference for the teal based bedroom design, we then ordered all the products and had the furniture and window dressings made. We engaged trades to fit electrics and decorate the room, then oversaw delivery of furniture, carpets and other furnishings. We hope this case study has given you plenty of bedroom design ideas.You can visit more bedroom designs – just follow the link to bedroom portfolio. If you have a bedroom to renovate in the Bath or Bristol area and think you might need some help, please contact us on 07711 857670; you may also care to read more about our other interior design services.